Mix the mayonnaise, the lime zest and the lime juice together in a medium bowl. Once those three ingredients are well mixed, add the coleslaw mix, scallions and cilantro. Mix well to combine all the ingredients, then season the lime slaw with salt and pepper to taste. Let the lime slaw stand so the flavors can combine while you are making the fish for the tacos. Heat the olive oil in a large skillet over medium heat until it is hot but not smoking. Do not allow the oil to start to smoke as it can burst into flames. If this happens, use baking soda to extinguish the flames. Season the fish on all sides with the chili powder and then the salt. The easiest way to do this is to put all the ingredients into a Ziplock bag and shake them well. Then add the fish and shake again to coat. Add the flour to the Ziplock bag and shake again so each piece of fish is well coated with the flour. Add the fish to the skillet and cook, turning once, until golden brown. This takes about 6 minutes. Transfer the fish to a paper towel lined plate so the excess grease is soaked up by the paper towels. Place a layer of paper towels on top of the fish as well to help hold the heat in and soak up additional grease. Place tortillas in a napkin-lined basket and close the napkin to keep the tortillas warm unless you have a tortilla warmer, then use it instead. 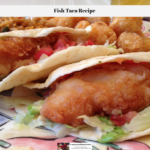 To make each taco, place 2 tortillas, slightly overlapping, on the plate and top them with 1 piece of fish. Break the fish up with a fork to make it easier to eat, then top with a spoonful of the lime slaw and roll up the taco.